Catfish are a unique species in the fish kingdom. They boast a bunch of features which enable them to survive in conditions other fish would not survive. Most importantly, they are different in appearance as they lack scales and have super sensitive whiskers (that explains the name), and their food preferences are different too from that of other fish. That means that catfish anglers cannot be like normal fish anglers. They must come up with a unique plan of attack if they don’t want to end up spending the whole day angling and going home with nothing. Fortunately, most catfish species will eat almost anything and as such, one thing that they particularly do differently is using unique baits. If you are planning to go catfish fishing and have no idea what to use as a bait, take a look at the top four catfish baits. 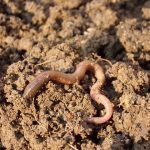 Worms, or night crawlers top our list of the top four catfish baits. There is just something about night crawlers that even the biggest catfish can never resist. According to most catfish anglers, night crawlers are the best possible bait for catfish as they not only seem tasty but also have a natural smell that makes it difficult for any catfish to detect that there is an angler somewhere. In addition, the fact that they are smelly and wriggle when you put them in water tends to attract big catfish and if your primary target was going home with a big fat harvest, then night crawlers are the ideal bait. Besides, they are not as messy as other types of baits because all you need to do is to hook them and you are good to go. You can float them, drift them or bottom rig them, whichever method you decide to use and be sure you can never go wrong with night crawlers. If you cannot access night crawlers, catalpa worms are also a great alternative and are readily available. If there another catfish bait that you can’t wrong with, then it is spoiled shrimp. You don’t have to make a fuss, because that bag of shrimp has gone bad in your house as you can use it to get you a fresher meal out of catfish. 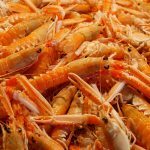 If you don’t have any spoiled shrimp, then pass by your local grocery store and get some as most stores are more than willing to part with the spoiled shrimp at a throwaway price to create room for fresh supplies. Thanks to their stinky smell, catfish can sense this bait from far away thus making work easier. Some anglers even go the extra mile by letting the shrimp bask in the sun for three to seven days. This makes work easier as catfish can sense this smell from miles away. However, you must keep in mind that this will be one smelly endeavor but one that is worth every minute as you get to go home with a good catch. Chiming in third on our top four catfish baits is another popular bait among fishermen; dog food. This might surprise you, but the truth is that average anglers try utilizing every weapon at their disposal in pursuit of getting a good catch. If you are going to use dog food as a bait, it is recommended to go for the canned type as it has this unique smell, is mushy and moist thus making it easy for you to get it on your hook. 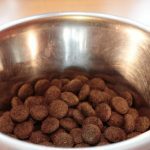 Even though kibble is ideal too, it is difficult to get it on the line and that is why we emphasize on canned mushy dog food. In addition, most canned dog foods have added flavors such as gravy which catfish love. If you want to attract more catch, it is advisable to mix the canned dog food with few spoons of flour and cornmeal and then mold it into fishing dough. You can use an onion bag or even puncture holes in the can itself and drop it near your ideal fishing spot before throwing out your line, so it can attract catfish, and this helps you get a tremendous catch. You can drop them a day before to attract as many catfish as possible to your fishing spot. This is also ideal for slow or non-moving water. If you prefer dry dog food, don’t feel left out because it can as well be used excellently as catfish bait. All you need to do is to crush it slightly and add to flour, corn starch and water, and it will make a stinky dough that catfish will gobble up eagerly. Even though catfish are mostly into stinky food, studies show that they also have a sweet tooth and if you cannot access any of the above, then, there is no doubt that you can get access to a packet of marshmallows from your local grocery store. Marshmallows are quite porous which makes them convenient to absorb other scents that can attract catfish, and if you insist on having a stinky smell, then you can always dip them in something smelly and fix them on your hook. Since they are lightweight and porous, marshmallows tend to float and as such, they are the perfect bait for catfish to use in shallow and slow water like rivers. There is no doubt they will attract the interest of a catfish as soon as you place them in the water. Catfish can be referred to as the foodie species of the marine world. These unique creatures eat almost anything thus giving anglers a diverse array of bait options to choose from. Nevertheless, if you want to take your catfish angling a notch higher, then you should take advantage of our list of top four catfish baits. They are not only economical but will also give you a great fishing experience.